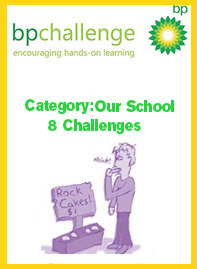 BP Challenge is a hands-on competition where students work as a team using simple materials to solve problems. 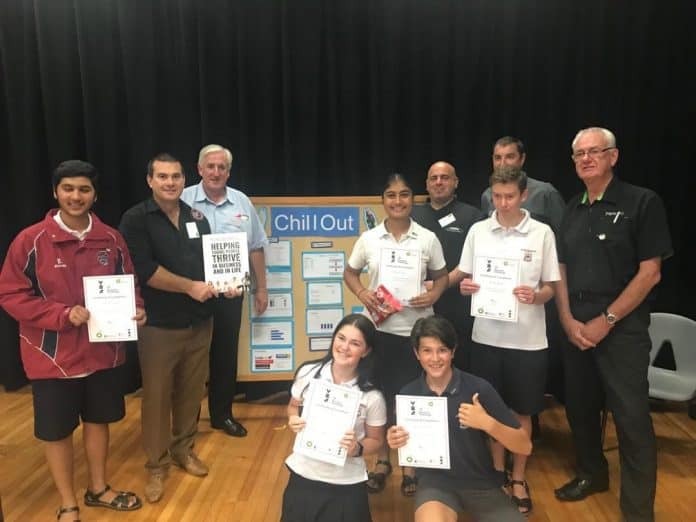 Once known as the BP Technology Challenge, the BP Challenge has strong links to New Zealand’s technology, science and mathematics curriculum and other curriculum areas. Over the past 21 years, many hundreds of thousands of students have taken part in Regional BP Challenge events, inter-school challenges, school-wide challenges and class challenges. We thank BP New Zealand and the Royal Society of New Zealand for allowing us to publish these challenges and make them freely available to all teachers. BP Challenges in Flip-book and pdf formats. 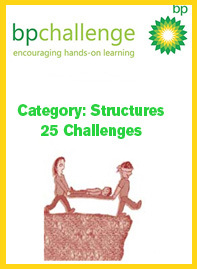 For a quick overview of the BP Challenges, browse through each category in our Flip-book format. To download the BP Challenge(s) of your choice, scroll down and locate it in pdf format in the appropriate section(s) below. Scenario:Your adventure company is to develop an exciting tourist activity which is in a remote location. Because there is no electric power available it is planned to cross a spectacular ravine by cable car using the release of stored energy as the driving force. Task: To build an aircraft that will fly as far as possible, using the materials given. Task: You need to launch an Earth-orbiting spacecraft to study the earth from above. You will be given some materials and your team will have to make the spacecraft within 20 minutes (longer can be given for younger students). Scenario: Your team is participating in a ‘Flintstone’ problem solving day with a number of practical tasks allocated to test your initiative. Task: To make a racer which will roll down a ramp and free wheel as far as possible. Task: Build a racer using the wheels supplied. Your racer, upon release, will propel itself across the floor using only elastic potential energy (either a rubber band, elastic, bungy cords, etc). Scenario: Yachting is a sport that New Zealanders are good at, perhaps because we are an island nation and the sea is easily accessible. In this Challenge you will be provided with a small moulded plastic yacht hull, or you may have to design and make your own yacht hull. Scenario: The sun’s energy is the basis of all life on our planet and its energy is trapped by plants using a process called photosynthesis to turn this energy into chemical energy which we call food. Man is trying to capture this renewable energy using various chemical and electrical means. One way is using solar panels. These capture the light energy and turn it into electrical energy. Scenario: In sharing stories of play in other countries you discover that many cultures have a tradition that involves spinning tops. Scenario:Science, geography and exploration were the drivers for numerous attempts to reach the South Pole early last century. Roald Amundsen was the first person to reach the South Pole in 1911, followed closely by Scott (who died on his return journey). In freezing conditions it was essential that you moved fast across the ice. Task: Build a racer powered by a balloon. Bring your racer ready-made; the balloon will be provided at the competition. Task: Build a device which will launch a table tennis ball into the air to stay airborne as long as possible. Task: With the materials supplied make a small aircraft able to fly in a curved path. Task: To make a kite which will be able to be flown over a spot 20m away and either land on it, drop a string as near to the spot as possible, or fly so low as to be within reach or dangle a string within reach (e.g. 2m altitude) of someone standing on the spot. Task: In a team you have an hour to plan and build a launch pad and vehicle. The winner will launch a vehicle that travels the furthest. Task: Using the materials provided you have 20 minutes to make a device which uses a balloon to lift a ‘satellite’ as high as possible. The ‘satellite’ can be of any shape provided it is a minimum of 3cm in one dimension and is made from any of the materials provided. It is to be released from the device after it reaches its maximum height. Scenario: When looking for a fun event for an indoor sporting programme, the organisers wondered whether a human powered vehicle event would provide the entertainment and interest they wanted. However, they had very little space available so the ‘human-powered’ element could be difficult to incorporate. A team thought they had a solution. Scenario: A box of urgently needed materials has been dropped from an aircraft, but although it has landed only a short distance away it is out of reach. It had fortunately broken open on landing and if a device could be made to reach into the box they could retrieve the materials. Scenario: The food available in the school tuck shop has been identified as too high in fat and sugar content. Can we design and make a healthy food product that is attractive to pupils to sell in a tuck shop? Scenario: Many schools have areas within the school grounds that are designated gardens but although they may have flowers and shrubs growing they are effectively a student no-go area. The challenge is to design a garden that is visually attractive but also is a place that is student friendly providing areas to relax with a book, chat with friends, play games such as petanque or enjoy some quiet time. Keeping the school environment litter free is an on-going problem in many schools. Increasingly, school communities are becoming more aware of minimising the amount of rubbish that needs to be dumped in landfills. One result of this awareness is the introduction of a method of sorting materials that can be recycled, and organic materials that can be composted, from other rubbish. This challenge involves the students in the design and production of a rubbish receptacle that enables rubbish to be sorted, and also incorporates features to protect the rubbish from the rain, wind and vermin. Scenario: Students are concerned because some of the surfaces on and under playground equipment become slippery when there has been rain or heavy dew. Scenario: Your school playground is in an open place and very exposed to the wind and the rain. Your school has been given $2000 to build a suitable shelter, which can also be used as part of the playground equipment. Scenario: Transporting equipment to and between classrooms and sports fields is an ongoing problem. Equipment gets dropped and lost and there is the added problem of having to return it all to its correct position at the end of the lesson. We need to design and build a trolley that is storage and transport system in one. Scenario:You have been asked to design a simple crane to lift an object for a building site. Task: To make a device that will transfer a cup of water into another cup using a marble and involving at least four different mechanisms. Scenario: The farmer has a water tank on his property. It is filled by rainfall but it is difficult to see just how much water is in the tank. Scenario: A container of very dangerous acid must be shifted to another safe place. 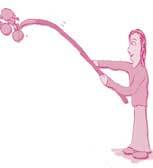 Scenario: Some friends watched a video of kids skipping with a rope and decided they’d like to try it too. They decided to make their own using the plastic bags they had nearby. Task: To build a device which will launch a table tennis ball into the air to stay airborne as long as possible. Task: A device needs to be made to launch a shuttlecock – the total distance in a horizontal line will be measured. It will use a commercially available shuttlecock – plastic or feathered and be triggered by one hand only. Task: To collect as many of the table tennis balls from across the ditch as you can in the time provided. You must build a device with the materials provided to lift each ball (one at a time) across the 2 metre gap. Scenario: Your tramping group is trapped in wild country and cannot cross a deep stream in your path. To make matters worse the balloon you have just inflated to send with a message on has been blown from your hand. It has landed in bushes on the other side of the stream. 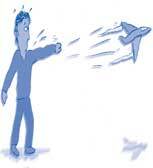 It is vital that you get it back quickly before another gust carries it away! Scenario: Fresh water is a shrinking commodity in most countries today. However, in a community with suitable ground water supplies but little technology, the problem of how best to pump it to the surface often requires low-technology solutions. This Challenge is to develop a suitable pump from simple materials which can model the problems to be solved when developing a full size pump. Scenario: Birds are posing a danger at airports and destroying farm crops. Boomerangs are probably the first flying machine invented by humans. Aboriginal boomerangs have been found that are over 10,000 years’ old. Returning boomerangs were originally designed for sport, and non-returning ones were used as weapons and came in many different shapes and sizes. Archaeologists have found them through-out the world; Egypt, Europe, Australia and North America. Task: On a pole, e.g. sun umbrella stand (1.5 m high), sits a tennis ball. The pole is not very sturdy and any heavy knock will tip it over and displace the ball. You are to make a device to retrieve the tennis ball without losing control of the ball from the time it is grasped from the pole to the time it is in your hand. Scenario: While exploring an earthquake-damaged and deserted town, two of you have become separated from the rest of your group, but have managed to locate them more than 5m below you. You are on a small piece of safe flooring on the first floor of a ruined building. The rest of the group has the GPS unit which you could use to find the meeting place. It is fragile and too valuable to survival to risk throwing it up to you. They can find only simple materials to make something to get it to you. Aim: Design a device to roll and aim a marble along the floor to hit a target in the shortest possible time; the marble is to be dropped into your ‘marble roller’ device. Background: The first appearance of the constellation Matariki in the morning sky is portentous. If the stars in the cluster are clear and bright, it is thought the year ahead will be warm and productive. If they appear hazy and shimmering, an unproductive year is in store. Matariki also indicates a change of season, in particular the start of the cold season. As the winter starts to fade, it is time to start preparing the land for planting and the cycle of food gathering (2 Matariki Challenges). Scenario: The New Zealand space mission has just pulled out of the atmosphere and is cruising away from Earth on its mission into deep space. The crew hears a thud! A meteorite has punctured the outer shield protecting them from the intense energy of the sun. A replacement cover must be improvised immediately! Scenario: The owner of a farm has a water tank that is at the back of his property. He wants to make it so that it will collect as much water as possible when it rains. Scenario: While camping at the beach a strong wind blew sand into your open packet of rice. You are almost out of food and need the rice for dinner. Scenario: Eight of your team have been stranded on a desert island. They are weak with hunger. To make things worse the only fresh water on the island contained a strain of a nasty virus that has rendered all of you speechless (oh yes it has!) One of your team has a broken leg (lower left leg) and a badly burned right arm. Just when you think things couldn’t get worse, you discover that on an island very close to yours is another team in (amazingly) exactly the same situation as you. You know a boat is to appear soon – but it’s only big enough to rescue eight people at a time. It’s you or the other team – who will be rescued first? Task: To build a track that takes a table tennis ball exactly 10 seconds to travel along using materials supplied. 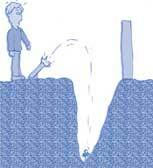 Scenario: A friend has been trapped in a cave-in while digging a hole. Help is on the way but he/she is in urgent need of fresh air because poisonous gases from an old landfill are seeping into the small space where he/she is trapped. The cave-in is only about 1.2 m deep and a narrow hole about 20 cm across leads down to the space. Scenario: A group of bounty hunters set off to find some treasure, including gold and silver. They were so successful there was too much to carry! They needed to make something to help them carry their heavy bounty home. Nearby were various planks of timber, and even an old chariot axle and wheels. They drew up a plan of the device that would carry their treasure. This plan included handles that would remain off the ground when they had to stop and rest, because it was a long trip home and the treasure was heavy. Task: In a team you have 1 hour to plan and build a device that can ‘bust’ down a building (in this case an empty soft drink can standing upright on its base) as far as possible. Task: In a team you have 1 hour to plan and build a launcher that will fire a ‘cannonball’ (a table tennis ball) for as far as possible. The first bounce it makes is the point it will be measured to. Task: You have 15 minutes to make a simple weighing machine to weigh out 150g of peanuts in a paper bag. Task: Support one marble as far out from the edge of a desk as possible. Task: Make a device which can reach over some ‘machinery’ to hook a ‘package’ and lift it over the ‘machinery’. Scenario: You are stranded on a balcony and unable to get inside or attract attention. Just 2m away is a ledge with succulent fruit which has dropped off an overhanging tree. You can not reach the fruit without falling off your balcony, which could be fatally embarrassing! You decide to make a device to grab the fruit to stay alive until rescuers find you. Scenario: Watching workers on a building site, a group noticed that they all wore safety helmets. One worker said they wore them because small items such as bolts or nails could accidentally be dropped by those working in higher parts of the building. Such items could be especially damaging if they hit the head. Task: Build a pair of stilts which one member of the team will use to negotiate a 6m course as fast as possible and grab a tennis ball (‘fruit’) on a pole held at the height just below their outstretched arm when on their stilts. Task: To make a sundial that would be capable of measuring two hours after midday (able to indicate 2pm). device must not be more than one metre high. Task: To make a device from the materials provided which will launch a table tennis ball into the air so that it stays in the air as long as possible. As the time will be measured from the moment of triggering the device to when the ball hits the floor, you are permitted to design it to have a delay of up to 20 seconds between triggering and when the ball separates from the launching device. Scenario: Polynesians navigated the Pacific using a multitude of techniques: knowledge taught through songs, location of certain stars in the sky and on the horizon, swell direction, wind direction, time of travel, wildlife species, and colours of the sea and sky especially near islands. This challenge gets you to investigate the way Polynesians navigated through the Pacific using one of these signs; the wind direction. Scenario: MacGyver is a television hero who has many adventures. On one of them he was knocked out and ‘comes to’ to find that some ‘baddies’ have him with his feet embedded in a newly poured concrete floor on a building site. The concrete has set sufficiently for him to be unable to pull his feet out but is not yet hard. The baddies inform him that there is a bomb nearby set to go off in 10 minutes time to blow up the building. They exit left. Scenario: A class had been studying historical events in medieval Europe. They noticed pictures of ‘siege engines’ and wondered if they could make similar devices out of simple materials. Scenario: You are going to visit a Marae and need to take your belongings in a pikau (backpack). You will need to make one because you have loaned yours to a friend. 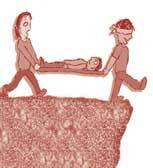 Scenario: A young child in your tramping party has been injured and needs to be taken to safety urgently. All that is available to make the stretcher are newspapers, string and sellotape. The trek out will be difficult and as you start the rear stretcher bearer is hit in the face by a branch and temporarily blinded. Scenario: Some friends were watching television and saw several athletic events. One was a race over hurdles, the other was badminton. They wanted to do similar activities but didn’t have the equipment. They decided to make their own out of paper. Scenario: On Anzac Day we take time to remember those who gave their lives for their country and for the generations who were to follow them. Scenario: You are part of a conservation team who are concerned about a shortage of food for native birds caused by a long, dry summer. Task: To build a model bridge which must sit on the back of two chairs facing outwards. The bridge must be as long as possible but strong enough to support a 500 g weight. Scenario: While watching a spider busily running back and forth on the wall and across items on shelves, it occurred to those watching that a sculpture with a similar moving ‘blob’ would be interesting and would also remind them of the spider. To gain ideas on what a sculpture could be like they observed the spider. It looked to be searching for food systematically, never seeming to stop moving, although it sometimes disappeared under items; it moved vertically and horizontally, at times balanced on very thin items. Scenario: You have left it too late to find a real Christmas tree for your mid-winterChristmas celebration. You decide to make your own decorative tree. Task: You are going to the moon! In a team you need to construct a ‘moon habitat’ where you could survive for some months while you studied the moon’s surface. The moon habitat has to be very sturdy and tough to withstand the freezing cold at night, and the searing heat during the day. Tiny space rocks also rain down on the moon. You will have 30 minutes to construct your moon habitat (teachers – you can give longer for younger students). Scenario: You are with a group in a very dry and hot situation, but which becomes very cold at night. Not knowing this was the case you need to have a shelter each night and have to make one which can be easily dismantled and parts carried by each person and quickly erected again. All you could find was some newspaper. Task: Just like seeds that are adapted to ‘fly’ when released from a tree, you are to make a structure that will allow an ordinary table tennis ball to stay in the air for as long as possible. Scenario: Your engineering company has won the contract to develop an exciting playground activity for the council park. Scenario: Your group is invited to a special ceremony where your team flag will be raised. Unfortunately the flag poles have gone missing and you must build your own. Scenario: Your Gemstone Exploration Company has discovered a huge natural ball of jade which is high on a mountain in the Southern Alps. To break it down would decrease its value enormously. Scenario: A group of friends is stranded because their money has been stolen. They decide to make music using discarded packaging items and raise money by busking, hoping that the novelty of their approach will encourage people to give generously. Scenario: You are a Project Design Team who have been commissioned by a home improvement chain to modernise standard equipment. Task: To build a structure to suspend a marble by the longest piece of string possible. Scenario: You are to be visited by a family with a preschool child who requires indoor entertainment. Scenario: Windmills can use the power of the wind to move water, power a generator and grind corn etc. The windmill transfers the force of the wind into rotational power. Task: Build the highest bridge over the longest ‘gap’ to support a 300g ‘vehicle’. The ‘vehicle’ will require a level road surface, at least 50mm wide and with 75mm vertical clearance, and be able to travel the whole length of the bridge. Scenario: After a severe earthquake and with night coming, you urgently need shelter for yourself and two friends, one of whom is injured, otherwise you could die of hypothermia. Your task is to make and earthquake shelter and you only have 30 minutes before it gets dark and starts snowing. Task: Using the materials provided you have 20 minutes to design and make a free-standing flagpole which can support a ‘flag’ as high as possible. Task: This is a classic challenge that gets you thinking about shapes and structures. It is easy to organise and really fun. In a team, make the tallest tower you can using only the materials listed below, in 20 minutes. Scenario: A competition has just been launched to design a challenging skateboard ramp for a new park. For safety reasons, all skaters must pass through a ‘check point’ at the end of each run. Scenario: Water towers are used to provide a ‘head’ of water which provides sufficient pressure to push water through plumbing systems to taps to supply water at a reasonable rate. If water needs to be filtered it must be supplied under pressure and a water tower provides constant pressure as well as being a reservoir. Of course, the water still has to be pumped into the reservoir at the top of the tower. Task: This challenges teams to develop the longest beam supporting a load without bending beyond the specified limit. Scenario: The purpose of this challenge/unit is to explore and develop understanding of the chosen Essential Skill ‘Cooperation’. Question: How can you capture and gather enough food before the Pied Piper orders you to start walking again? Question: How can you best carry the fish and fruit you have gathered? Your group will need to make two baskets with handles. Scenario: As the mountain closes, you notice a small gap or tunnel in the rocks. Is there a chance you may be able to send a message through it, telling rescuers where you are? Scenario: You don’t want to rush around the tunnels! How can you tell if there is something nasty lurking around a corner? You need to make a periscope. Scenario: A mother is calling to you from the window of a burning building. She wants you to catch her baby. You need to build a net to catch the baby. 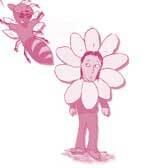 Question and Answer: How do the spiders trap the child as he/she searches for his/her friends? Question and Answer: A particularly nasty spider keeps following you. What can you do about it? You decide to make a spider trap! Scenario: At the Marae you are told of the legend of Rata. Rata was famous for building a waka (canoe) and then waking up in the morning to find the manu (birds) and ngangaru ( insects) had turned his waka back into a rakau (tree). Question: You hope your ‘Message Carrier’ has worked and someone is following to rescue you. How can you help them to do this? Question: How do trolls see in the dark? Scenario: The computer room needs to be protected from burglary. This challenge involves designing and making a device or alarm that will be activated when an unauthorised person enters the ICT room. Question: When resting, how can you protect yourself from the constant drips of water that come from the roof of the cave? Question: What can you do to celebrate your escape from the Pied Piper? Scenario: A group have had their clothes ruined. They are in need of some emergency clothing as they have to make a submission to a Government Select Committee. The only materials they can find are brown paper and sticky tape. They decide to make some formal clothes out of that and explain their predicament to the Committee. Scenario: You have been the victim of a disaster. You are lying on your back and your feet are trapped under a beam so you are unable to move. Unfortunately, your cell phone – which is your only means of rescue – is out of reach. The rest of your party are trapped on the other side of a chasm created by the quake and unable to help, but are able to shout instructions to you. Task: Your challenge is to make an outfit from the materials provided which is as creative as possible, using only the materials we’ve given you. Your outfit must have your team’s name on it somewhere which is easy to read. Scenario: A group of friends decided to go for a walk in the country on a mild day in autumn without paying much attention to the weather and without taking extra clothing. However, after an hour they realised that the weather was about to change very quickly — and it looked like they were going to get very wet and cold. It was late in the afternoon and there was no shelter nearby. They realised that to avoid hypothermia they would have to find some way of keeping dry and warm, and especially finding protection from the wind. Scenario: Your city/town/school is to hold a Summer Flower Festival with a parade of floats and wish to have children dressed as flowers running among the crowd. Scenario: Your group (which includes a blindfolded person) is caught by growing darkness in an open space with head-high tall grass around you. You decide to wait to be rescued. You have some gear in your pack that might be useful to help your rescuers locate your group. 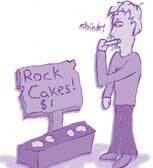 Scenario: A person was setting up a small business making unusual jams for gifts. She wanted to package them in spherical containers so they would be distinctive. To stop the spherical containers rolling off the shelf they had flat bottoms (and flat tops for the lid). To send them to shops they had to be packaged in a large carton. The problem was to make the most economical size carton for the number of containers of jam. Scenario: Your school is in need of extra cash for resources. A special package may be needed! Scenario: A local nursery has been selling small pot plants around New Zealand. Unfortunately, there are always a few damaged in transit. The local packaging company has been asked to design a cardboard container. Scenario: Supermarket bags are not very strong and often break or split when filled with heavy and sharp grocery items. How can we use old recycled supermarket bags to make a super supermarket bag that will not break so easily? Scenario: It’s the last night at camp and the theme for the night is Mid-Winter Christmas. Someone forgot to get the costumes for Santa and his Fairy. Scenario: Santa’s elves have asked for your help. The machine which bags the Smarties for the Christmas stockings has broken down. Scenario: You have been invited to design a new toy by the large toy company ‘Toys R Us Lot’. They have given you a range of materials and await with interest to see your ideas! Task: With the active participation of all members of your team, your task is to brew and bottle a six pack of Ginger Beer. The bottles should be 330ml size, or similar, and sealed or capped efficiently. The bottles will be labelled and promoted with your own graphics or design, given a product name and made to look attractive and marketable. The six bottles must fit neatly into a firmly constructed cardboard carry case, capable of being moved easily and safely. Scenario: Some friends are trapped on the other side of a wall across a deep ditch. They are behind a locked gate and do not have the combination to undo the lock. Scenario: Busking for extra money seems like a great idea so a group of friends decide to use simple materials to create three puppets. The puppets and all of your group must present a ‘tale’ or ‘myth’ based around your town or city. Scenario: You are sailing across Cook Strait at night in your yacht. You go down into the cabin to find it rapidly filling with water! You only have time to grab your emergency rescue beacon before your yacht sinks. You throw it into the sea and hope the water triggers the light to shine and draw another boat to your rescue. Task: To design a board game using the materials below within 30 minutes, that can be then ‘played’ in a group of 2- 4 players. Scenario: Your group find that they are in a situation where they need to split into two groups but be able to communicate with each other without others being aware of the communication. The risk is that other people may look at the messages and successfully decode them. Can the group develop a simple system which they can use quickly and which others may not be able to recognise as coded messages nor decode? Scenario: A group had developed a range of tasty foods in their food technology class and decided to have a stall at a local fair to sell them. Make a sign which could be read from different angles from at least 10m away, which could be made from simple materials and which wouldn’t require strong supports in a brisk wind. The word FOOD is to be shown on the sign. Task: To build a device to speak a message to one of your group 2m from you at the other end. The device will have to be able to be pushed through one or two holes in a ‘wall’. You will be given a brief message to speak to the team member at the other end, who will then tell the judge who will mark its accuracy. Scenario: Andrew’s and Katie’s neighbour, Mrs Moore, has a pet dog. During the day, she often lets it roam in her section. When it wishes to come inside, it often has difficulty attracting her attention. Its bark is not very loud. 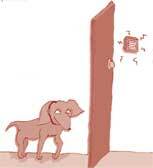 The children suggested a ‘pet door’ but Mrs Moore is afraid other animals might use it. Scenario: You need to be able to stop a train or car speeding toward a catastrophe; a missing bridge, a fallen tree, a crash up ahead. Task: To make a mechanical timer from the materials provided which will turn on a clearly visible battery powered light 2m above the floor 36 seconds after the timer is started. Task: To build a moisture detector able to detect and measure the depth of water at different levels in spaces accessible only through small holes above them. A layer of expanded polystyrene particles will be floating on the water surface (they are waterproof and non-conducting). Task: To make a crane which will be able to raise a plastic soft drink bottle weighing 200 grams as high as possible and as far out from the crane supports as possible and which will signal as accurately as possible when the object passes the 1.4m mark. 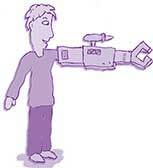 It is to be operated by one person. Next articleMaketu Pies Sponsor Te Puke Film for the second year in a row!